Written by alessandro on March 23, 2014 . Posted in All Stories, Curiosity, Food and Drink. Rome isn’t just a city of views and walks, but so much more. That is , if you know where to go and you know where to look. Among these places, we will help you to free yourself of the decision of which trattoria to choose among the many Rome that has to offer tourists and Romans, for the very best St. Valentines evening. 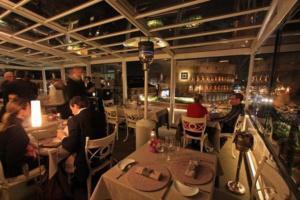 In fact, in Rome , you can find restaurants and pubs with amazing views and divine food. 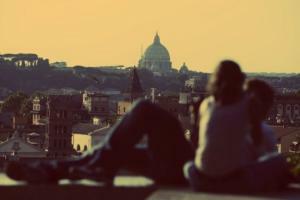 We will present three of the best Rome has to offer. Lets start now! 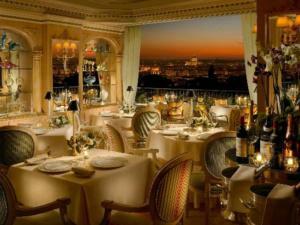 In the Hotel Hassler in Rome, you will find Imago’. The restaurant is positioned with a stupendous view from Trinita’ dei Monti, from where you have a 360 panoramic view of Rome, from St. Peters to our B&B. The prices are a little high, we’d like to tell you before you discover this with your own eyes. All of their dishes are astonishing, from grilled fish fillets of Rombo with nuts, or pasta, thick with tomatoes, flowing like Mount Vesuvius, all thanks to chef Francesco Apreda, from the class of 1974 in Naples. Near Circo Massimo you can find Ristorante Consolini, in the perfect location to pop over to the Mouth of Truth ( Bocca della Verità) after dinner, or to take a walk in the Jewish quarter of Rome. Baked pastries , custards and puddings, but also fish and homemade pasta., in a decidedly delicious surrounding. St. Valentine’s evening in front of the Colosseum. No, not hidden or next to it, but really in front of it. 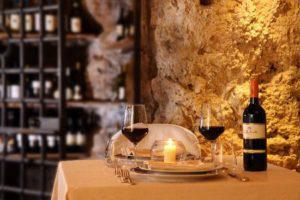 At Il Ristorante Aroma , you will enjoy a marvelous view , illuminated on one of the most beautiful and special evenings. This restaurant offers diverse menus of fish, and excluding drinks, affordable.prices. But for one night, you can splurge a little, no?